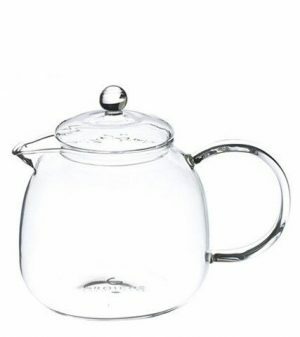 Loose-leaf teapot made of borosilicate glass, 25-35% heavier than comparative teapots. Capacity of 1250 ml / 42 fl. oz. The MONACO from GROSCHE is a high-quality loose leaf teapot. The MONACO is an example of elegant design, and great functionality coming together in one gorgeous teapot. It is made of sturdy and durable borosilicate glass, 25% to 35% heavier than comparative teapots. The slits of the glass infuser allow for a full and complete infusion of your tea. Its large 1250 ml / 42 fl. oz. capacity is great for three to four large teacups at a time and will serve the whole family. 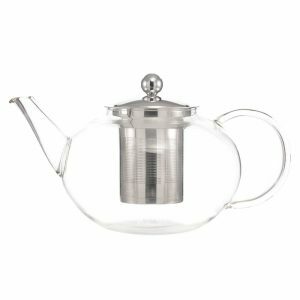 The MONACO is a loose leaf teapot made of hand-blown borosilicate glass, which is a high-grade thermal glass. It’s heatproof, can easily withstand boiling water and will never go cloudy even after years of use. The MONACO does not have any plastic or metal parts and will never impart a flavour to your tea. Drop your desired amount of loose-leaf tea into the infuser and gently pour boiled water through the infuser into the teapot. The tea will gain color and expand comfortably in the infuser. Once the steeping time is up, remove the infuser from your tea and replace the lid. The MONACO also works great for showing off a blooming tea. Simply place your blooming tea inside the teapot without the infuser and pour boiled water inside, then replace the lid. 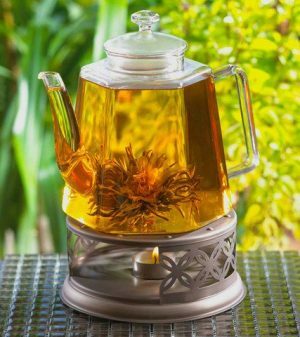 The MONACO loose leaf teapot makes it easy to pour a cup of tea with its large all-glass handle and non-drip spout. The glass teapot is dishwasher safe. However, we recommend gently rinsing it out after use with some soapy water to avoid accidental breakage in the dishwasher. Never use harsh metallic scouring pads or metal spoons in a glass teapot.